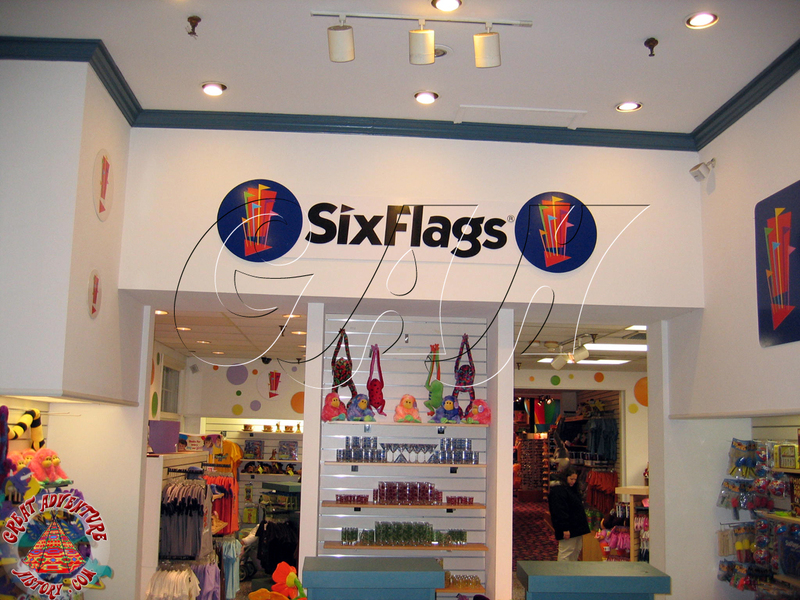 No trip to a theme park would be complete without a souvenir, and most parks have a variety of locations where park souvenirs can be purchased sometimes with specific themes for the sections of the park. 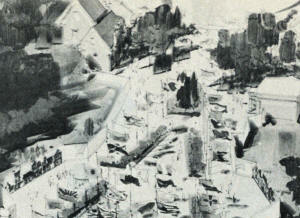 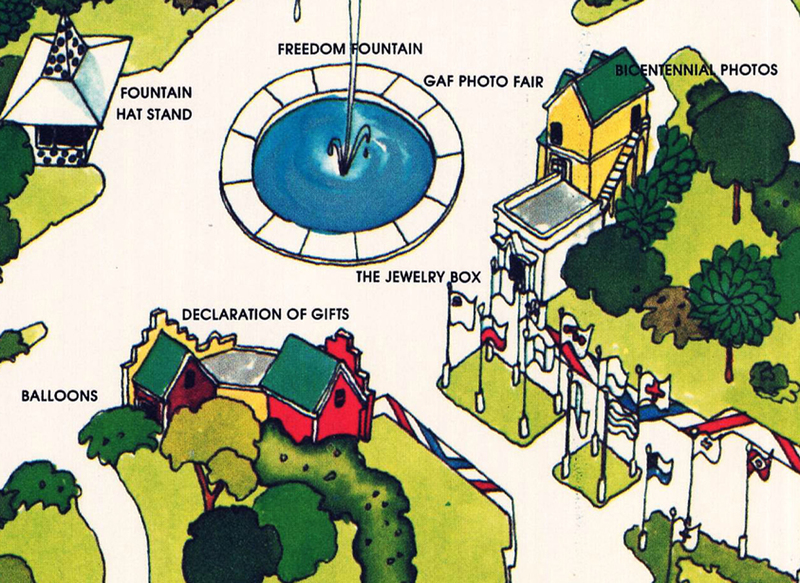 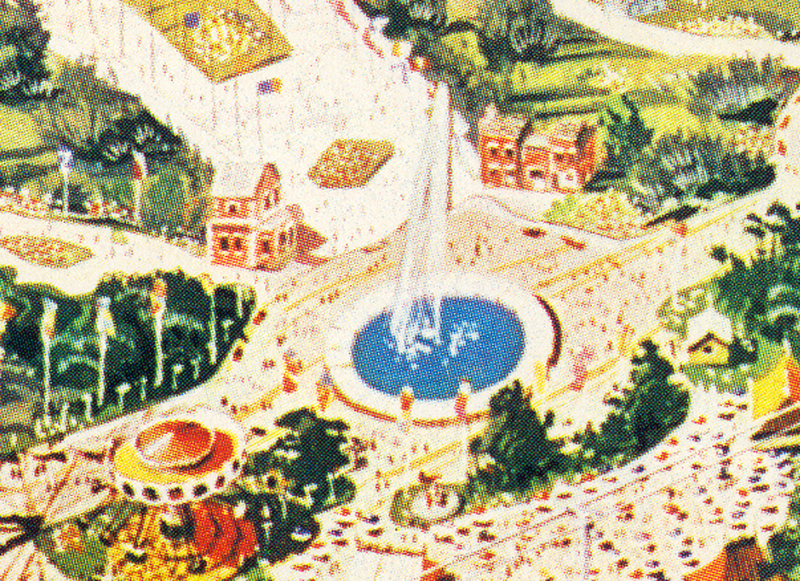 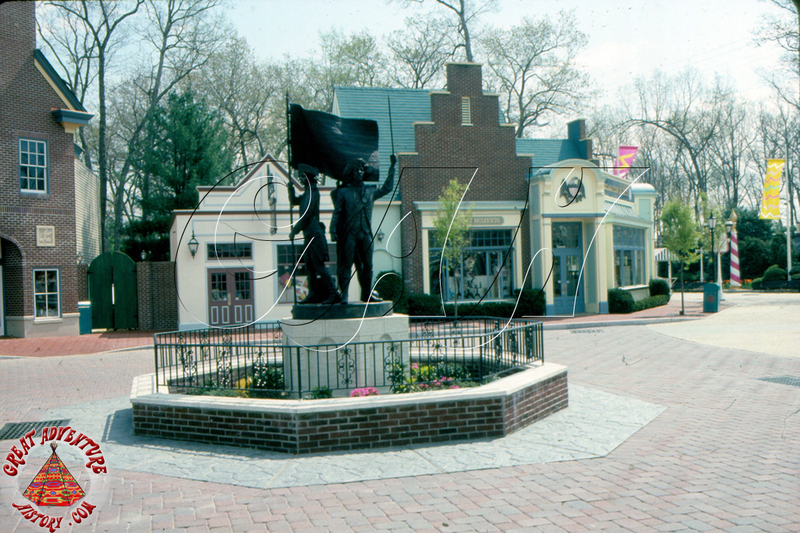 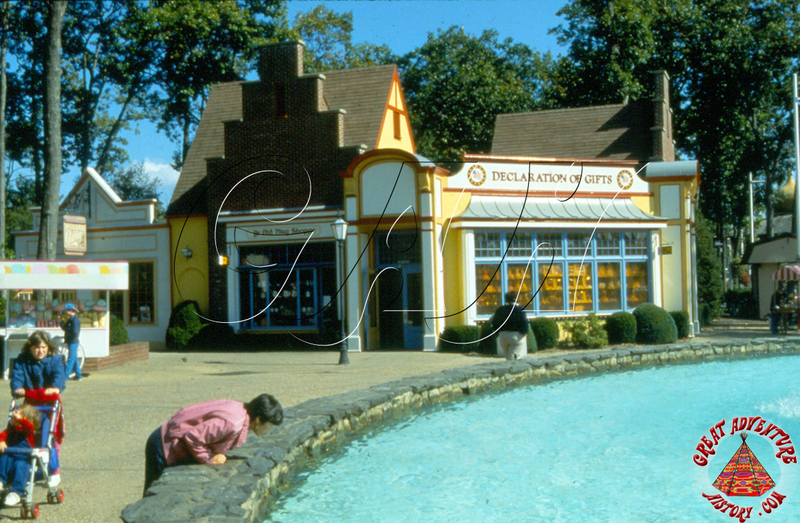 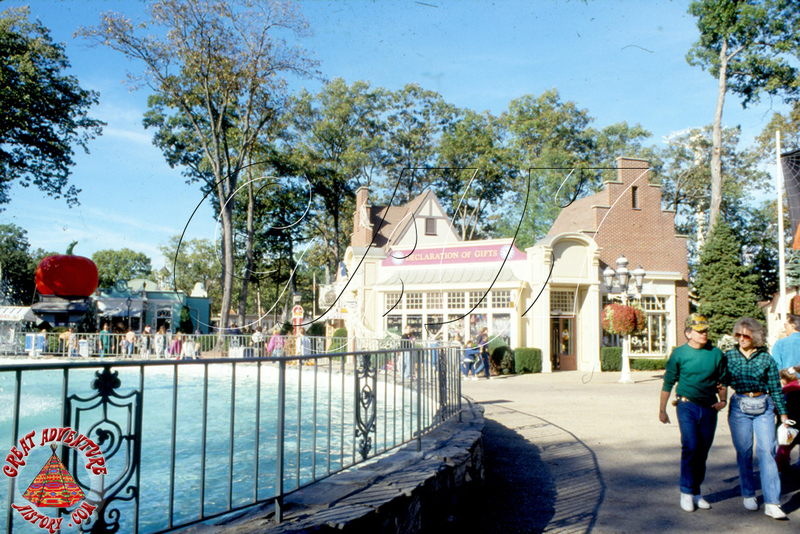 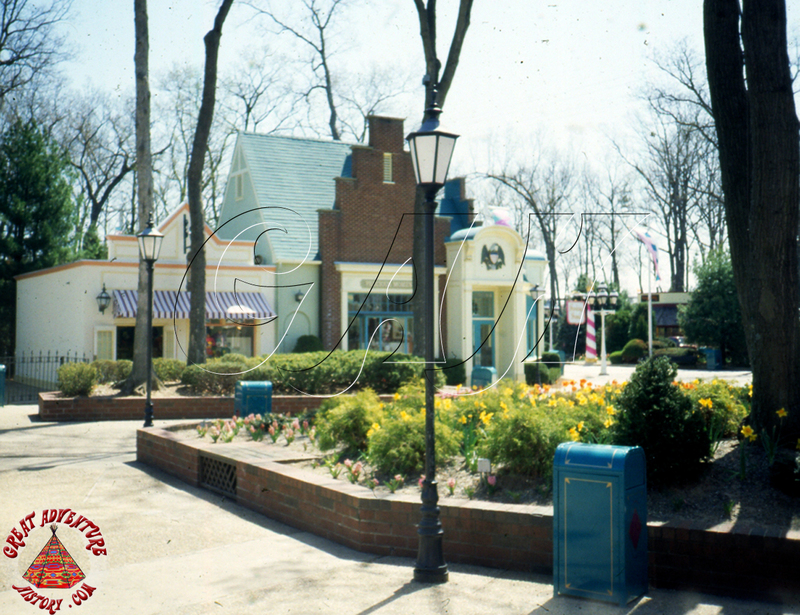 For the 1976 season Great Adventure relocated the entrance plaza from the head of Dream Street to the center of the park. 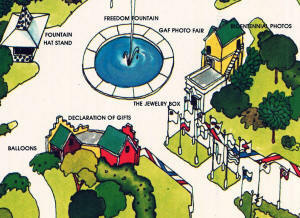 The new plaza, referred to as Avenue of the Flags, was given a patriotic theme to celebrate America's Bicentennial. 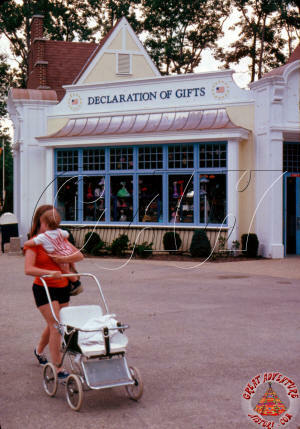 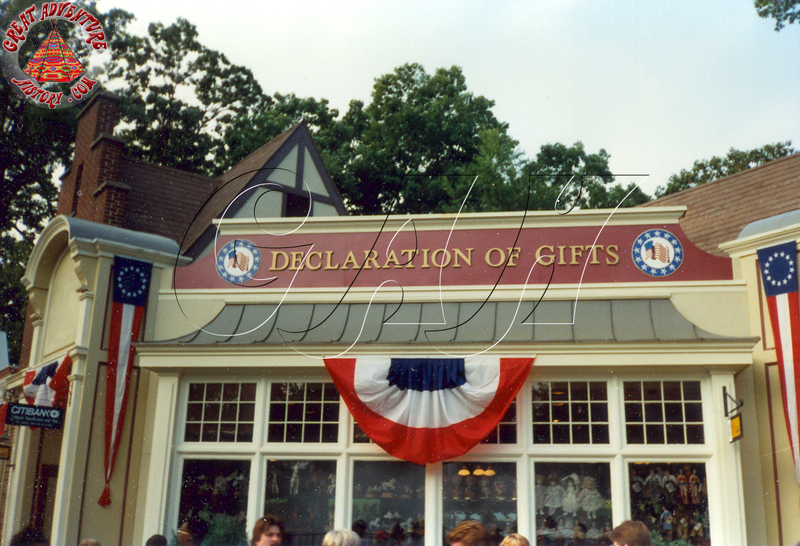 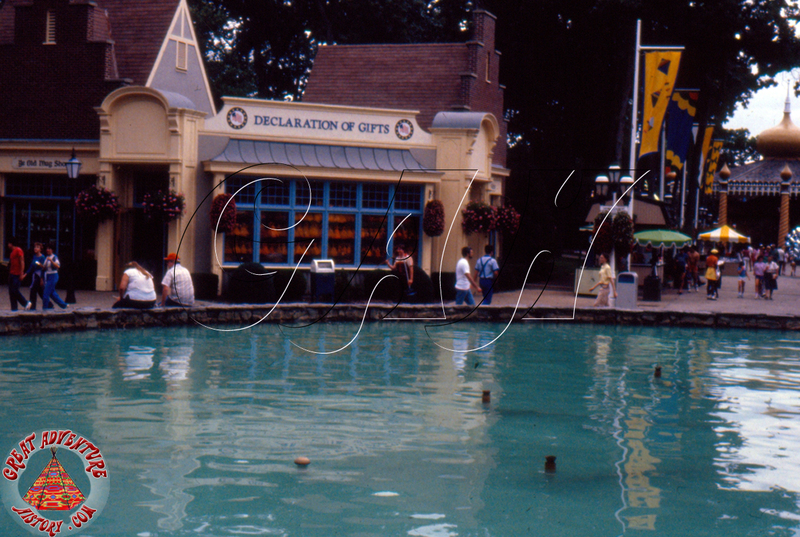 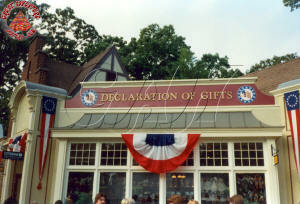 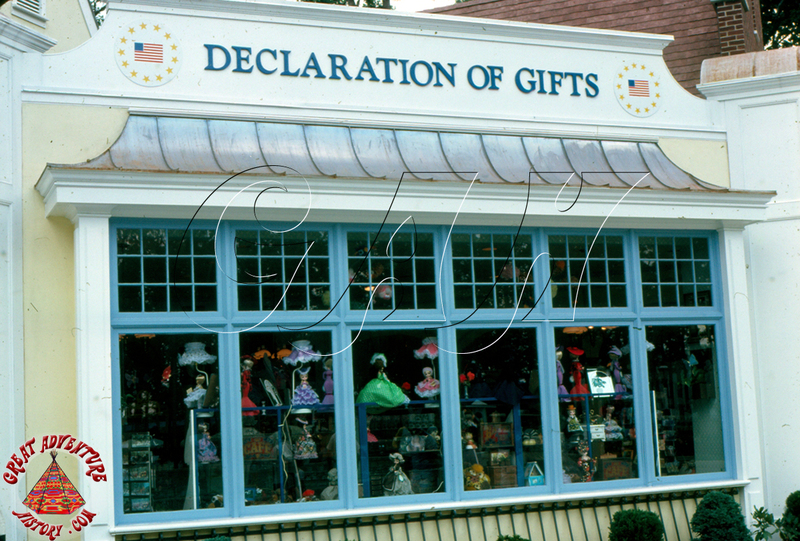 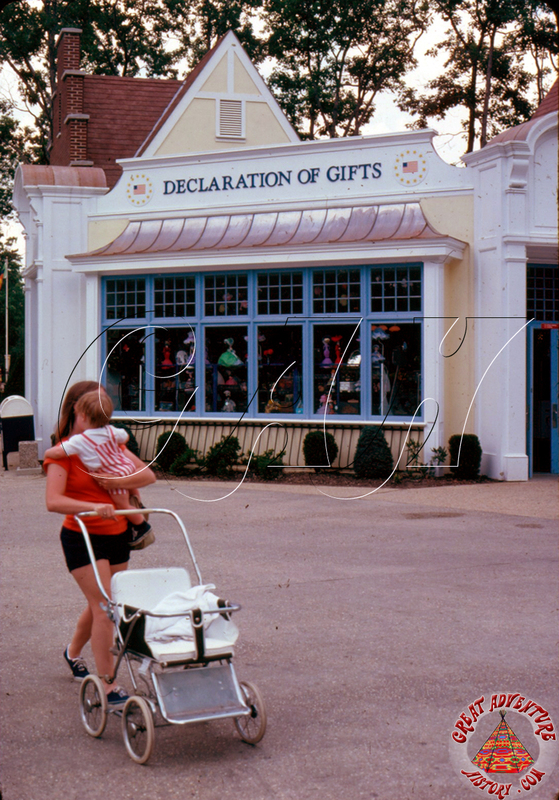 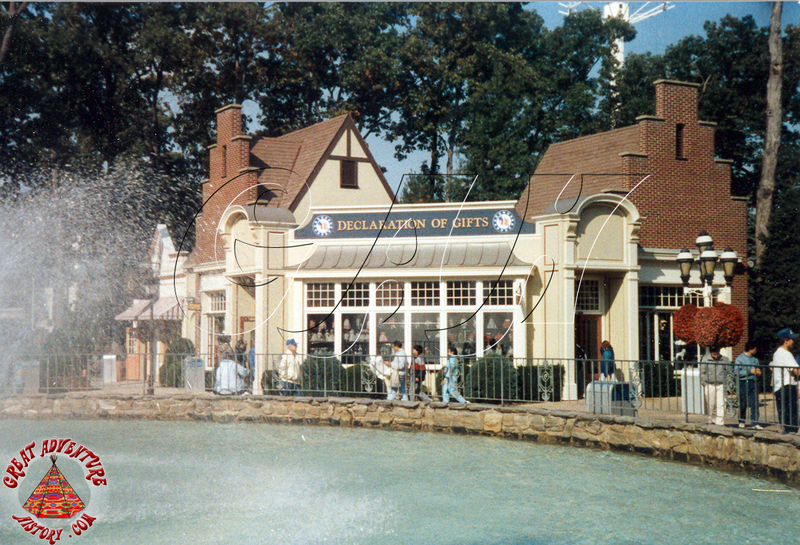 As part of this new plaza new gift shops were built flanking both sides of the pathway, the largest of those being Declaration of Gifts, which would serve as Great Adventure's primary merchandise location for souvenirs for guests entering and exiting the park. 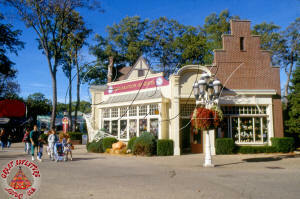 The colonial themed L-shaped building featured several rooms each with shelves of Great Adventure souvenirs and collectibles. 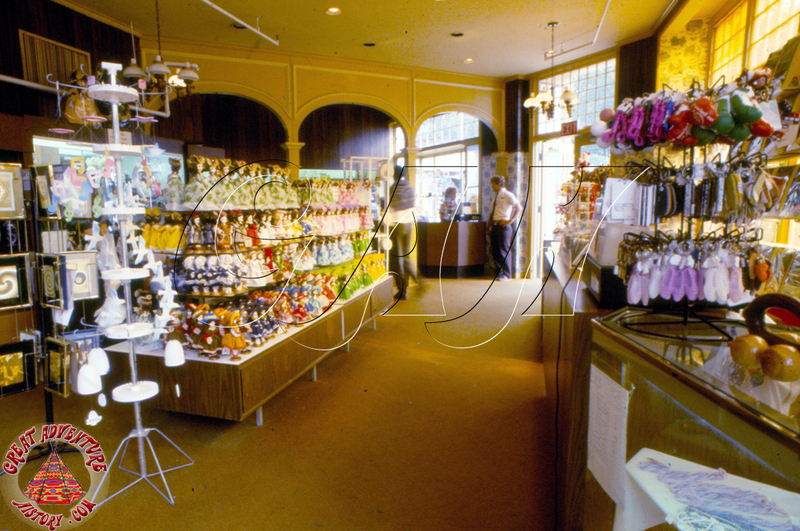 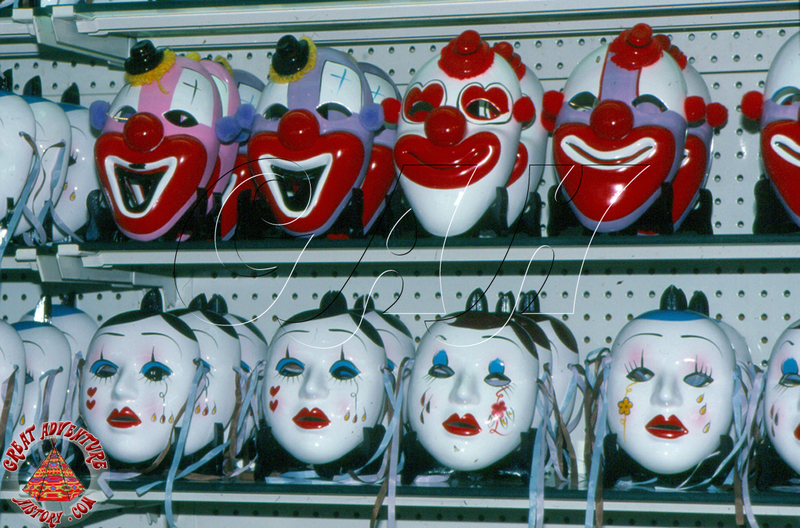 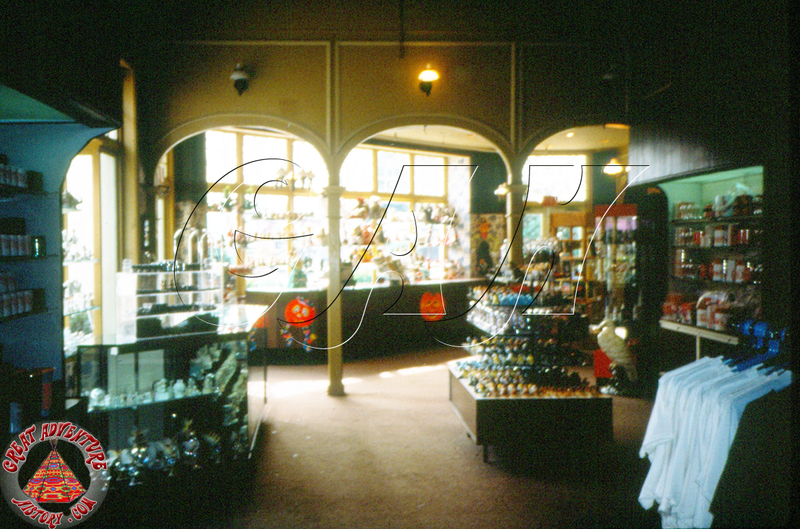 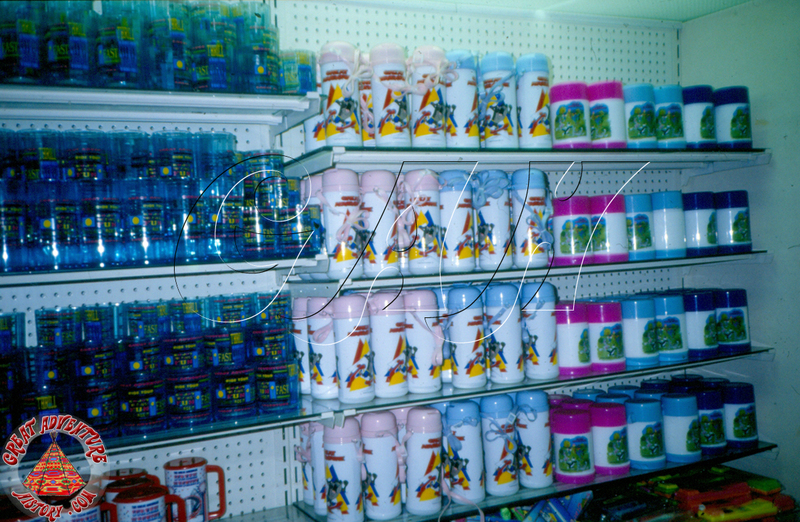 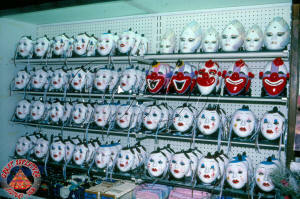 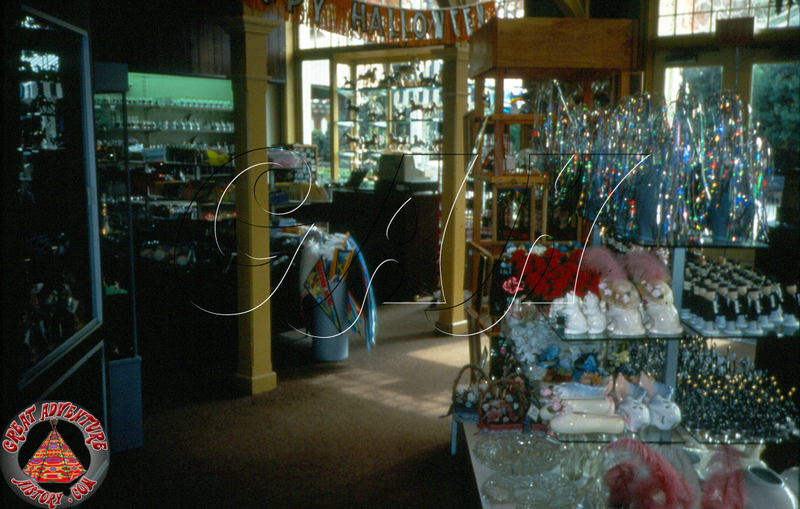 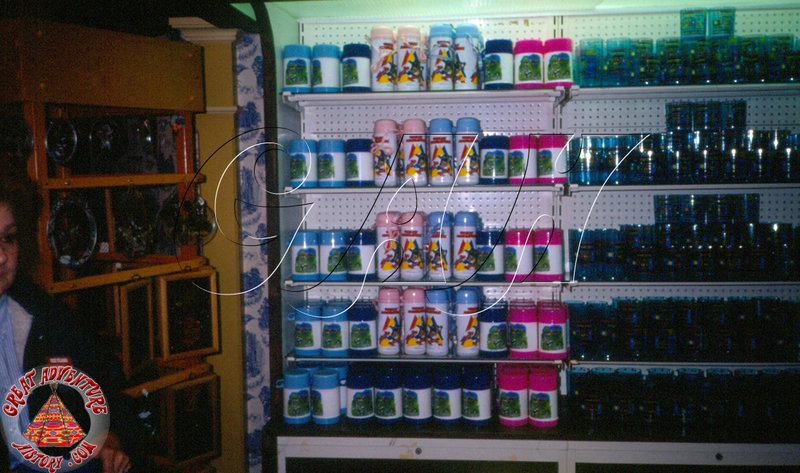 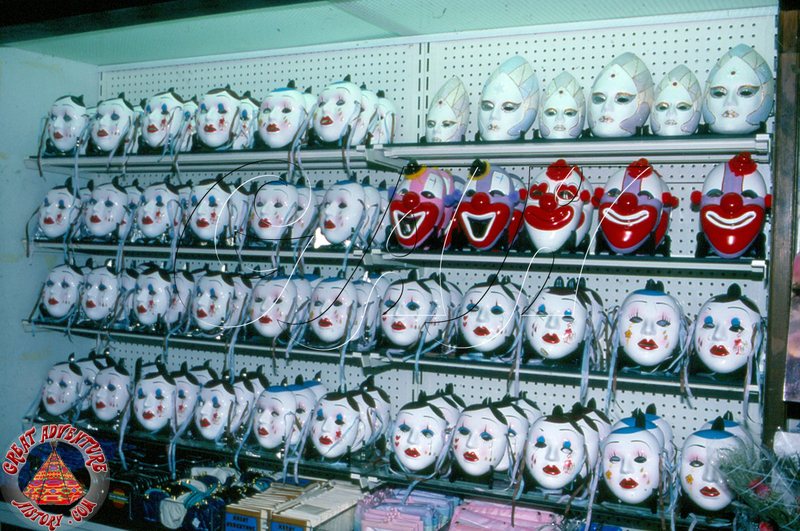 The store featured some of the most delicate and expensive items in the park including glassware and ceramics leaving the plastic toys and novelties to the smaller stores. The decor was typical colonial-style which was commonly found in homes of the 1970s. 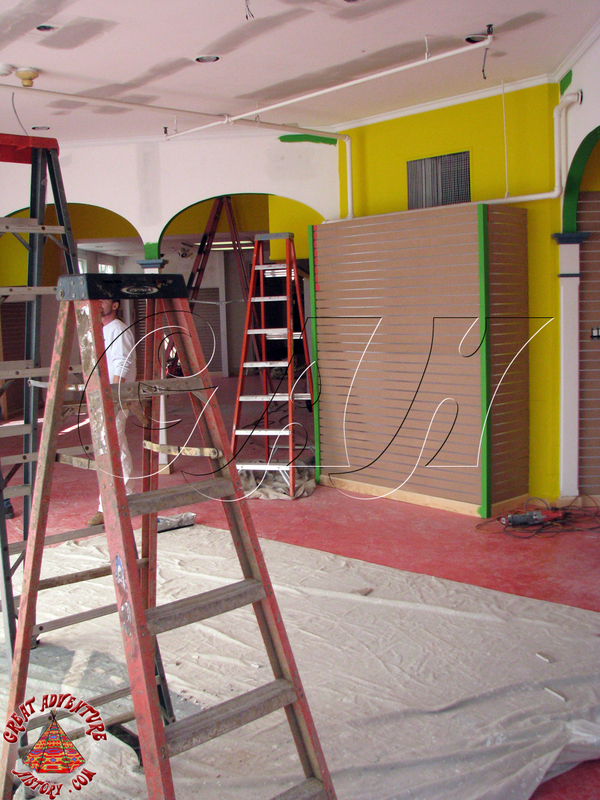 The walls featured dark wood paneling with yellow and olive green accents. 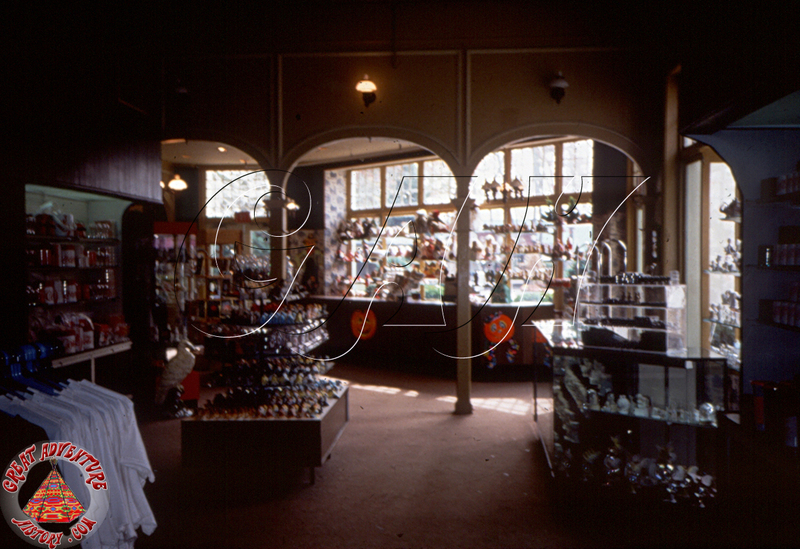 The light fixtures were brass with white milk glass hurricane domes and the glass windows included stained panels to make the shop fit the early Americana theme. 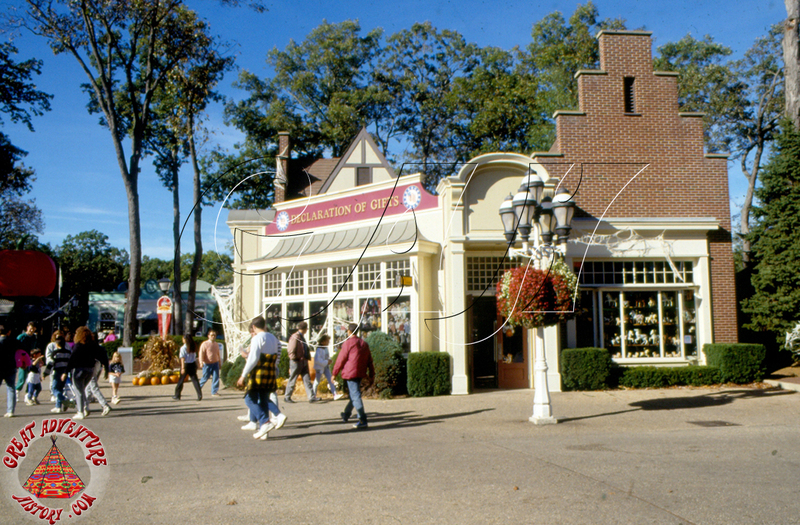 The location of the shop right at the hub of the park near the Fountain made it the last stop for many guests as they got ready to leave the park for the day. 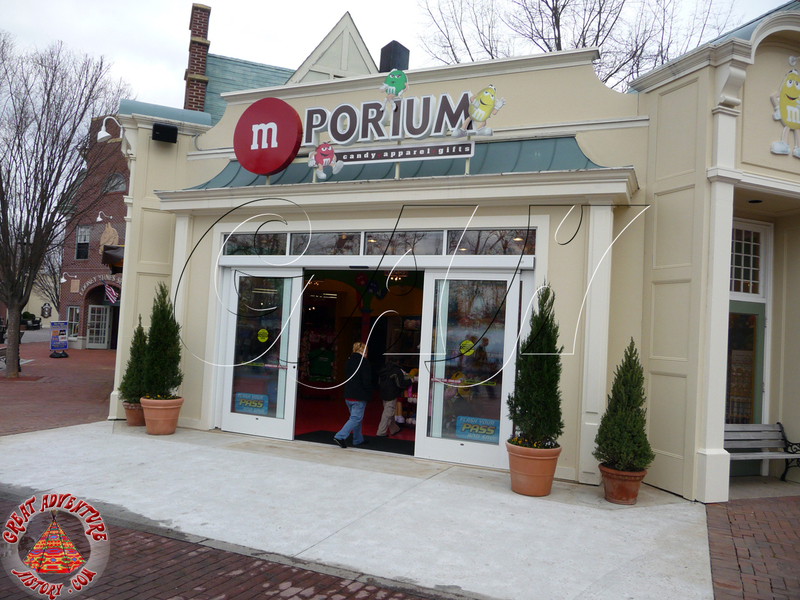 For many kids, this was where they would stop to try and find a gift for their mom. 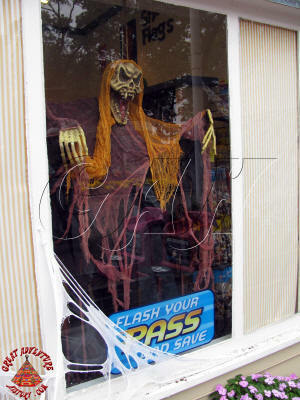 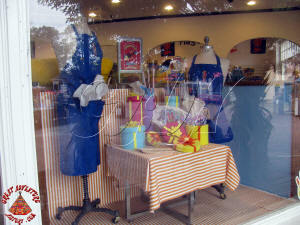 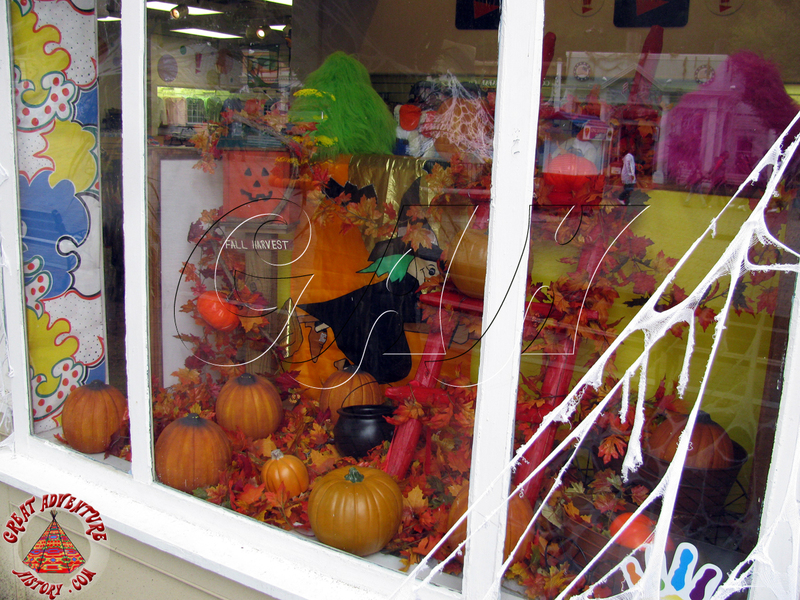 Merchandise offerings varied from season to season with the shop's main window serving as a display for the latest merchandise to the passing guests. 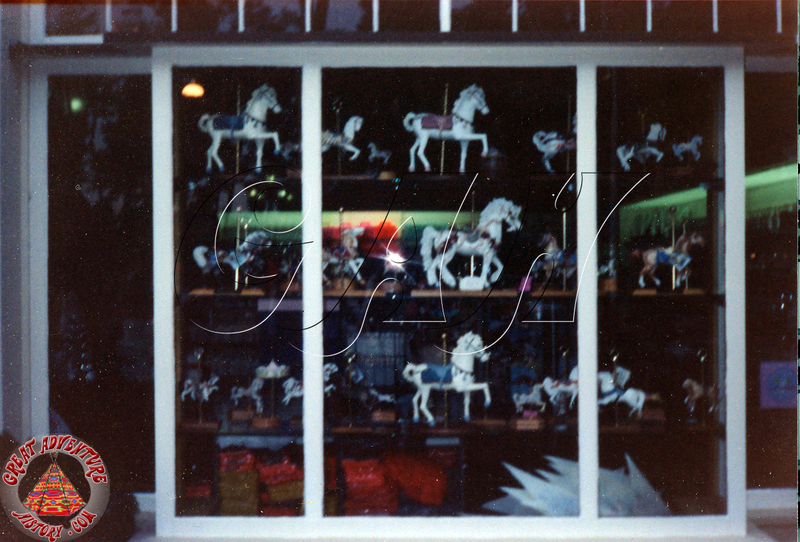 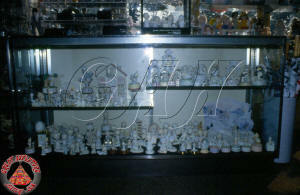 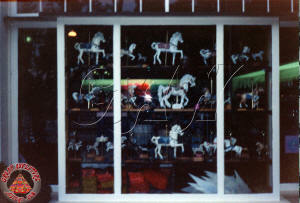 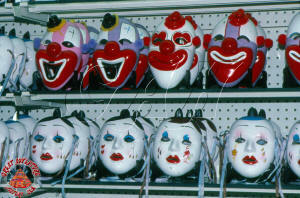 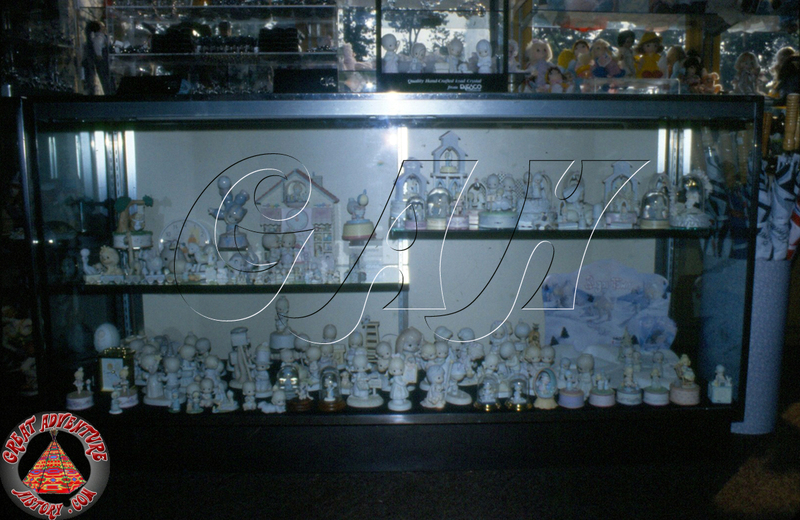 Collections of souvenirs included porcelain dolls, drinking mugs, and carousel horses. The Declaration of Gifts building was designed with several facades, making it appear to be several small buildings clustered together. The building was just a small structure right on the corner of Dream Street and Main Street. 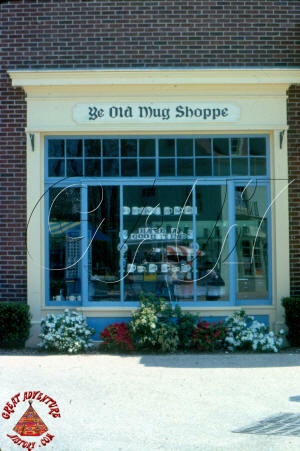 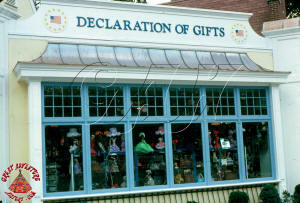 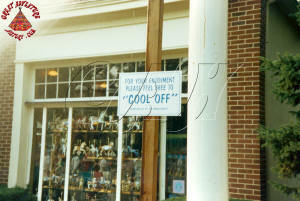 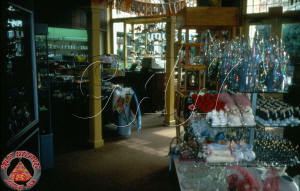 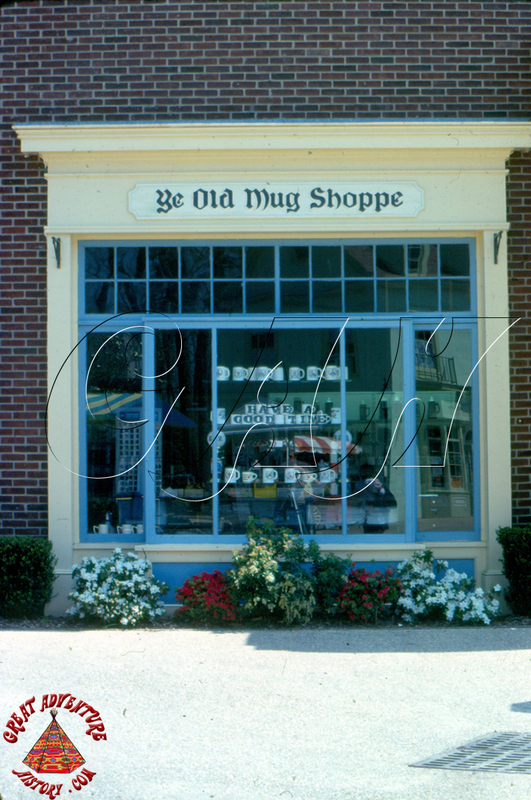 In the 1980s the shop was expanded with the addition of the Village Clothiers shop adjoining the Declaration of Gifts. 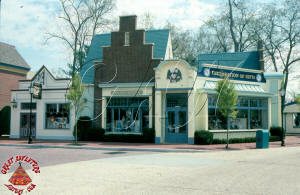 In later years it would become part of the expanded Looney Tunes Shoppe that exists today. 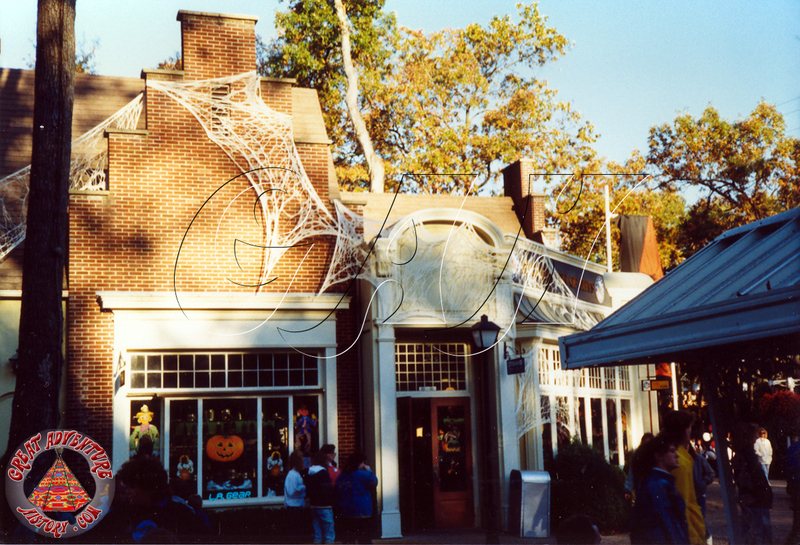 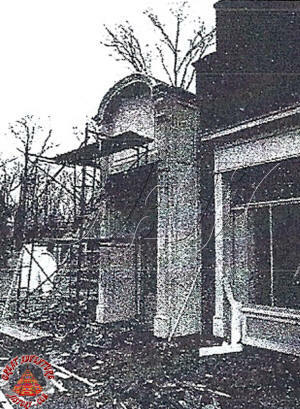 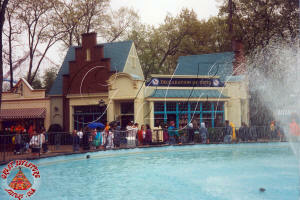 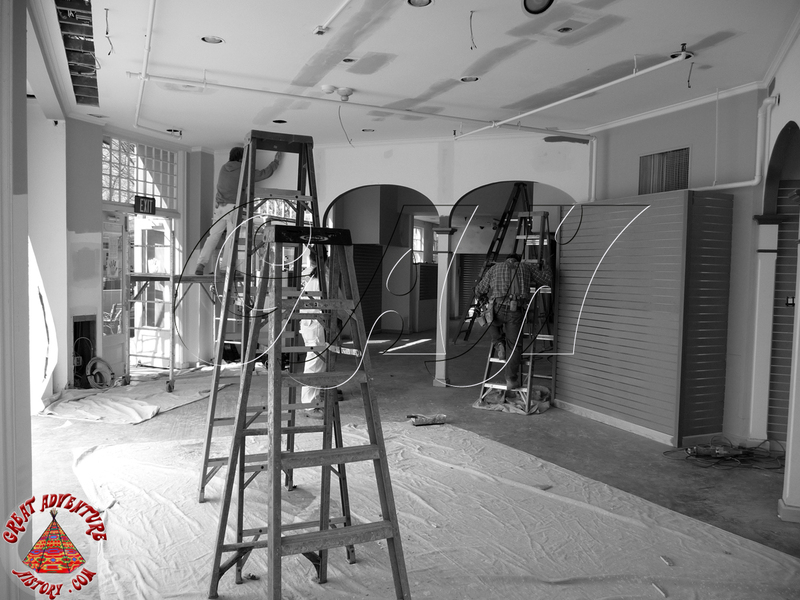 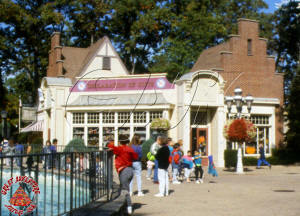 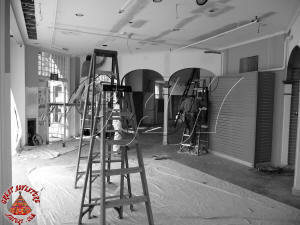 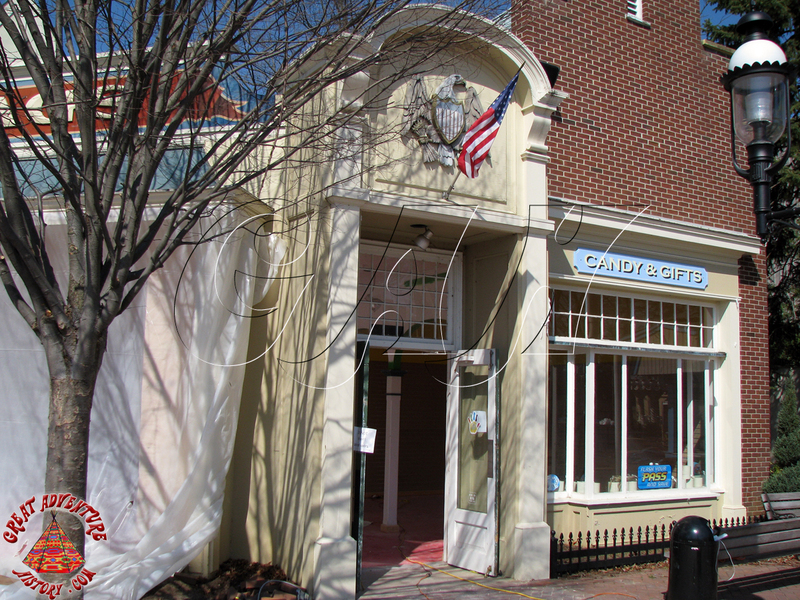 In 1993, the dark wood-clad colonial theme was stripped as the shop was totally remodeled. 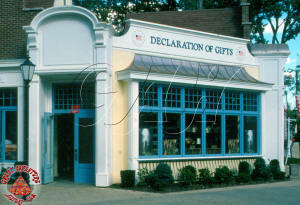 The store's interior was painted colonial white, recarpeted, and adorned with cherry wood and glass display cases. 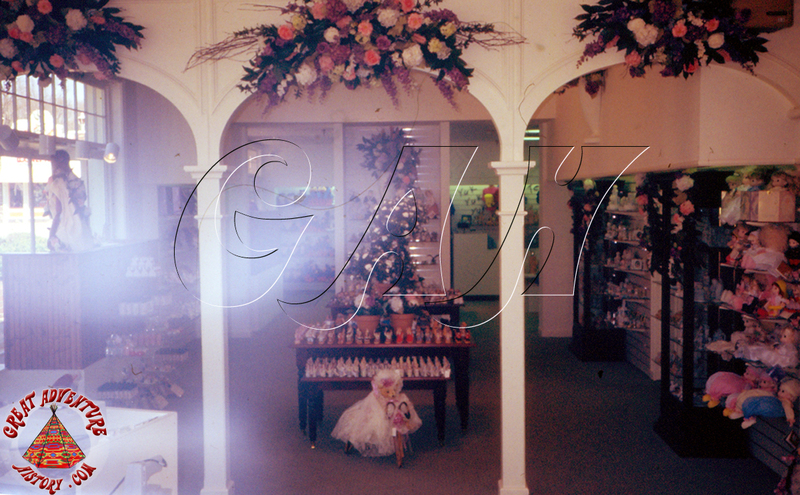 Silk flower arrangements along with a floral scent dispenser and a new Bose sound system playing classical music provided for an upscale shopping adventure. The updated interior featured refinished arches separating the space into rooms each featuring different themed merchandise. 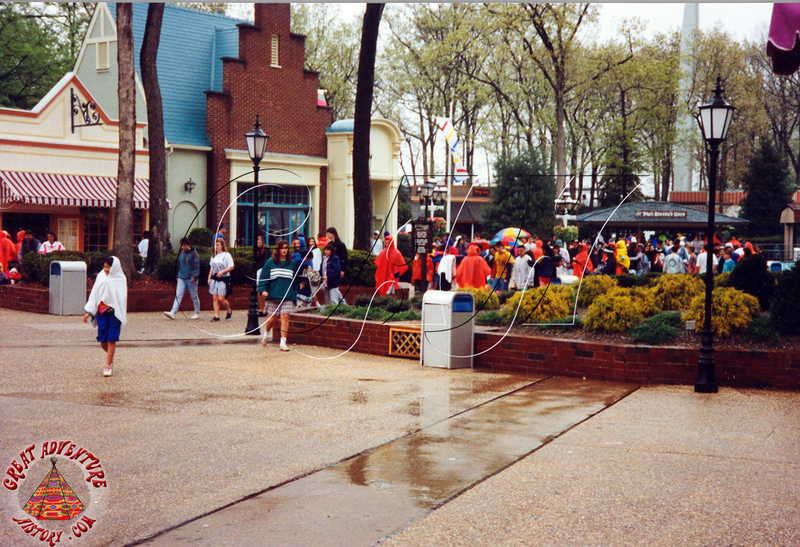 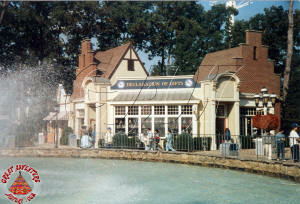 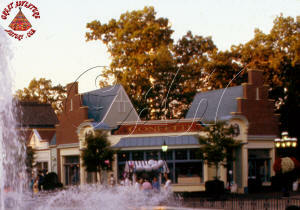 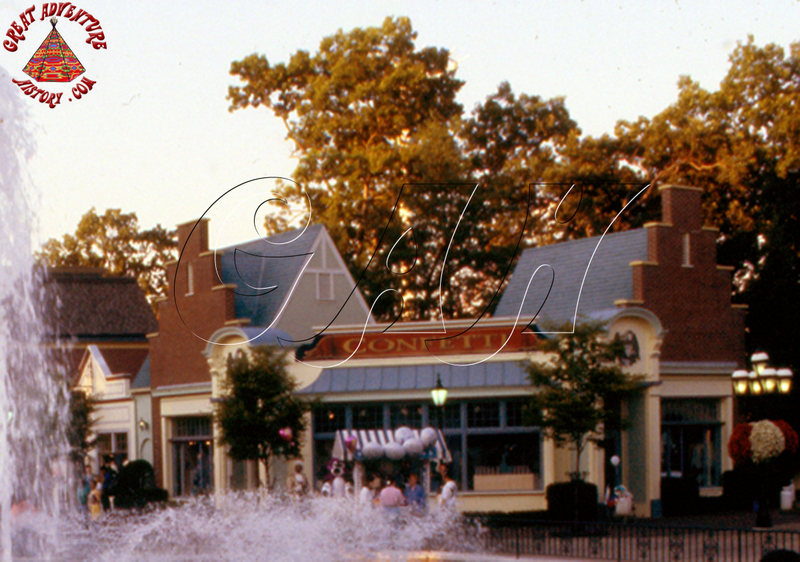 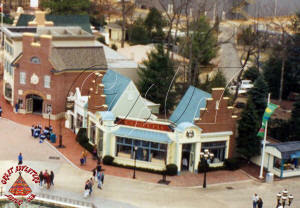 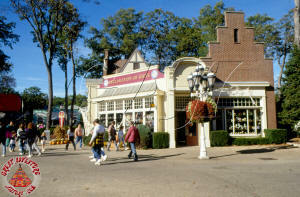 For the 1994 season the shops along Main Street were expanded in a big way. 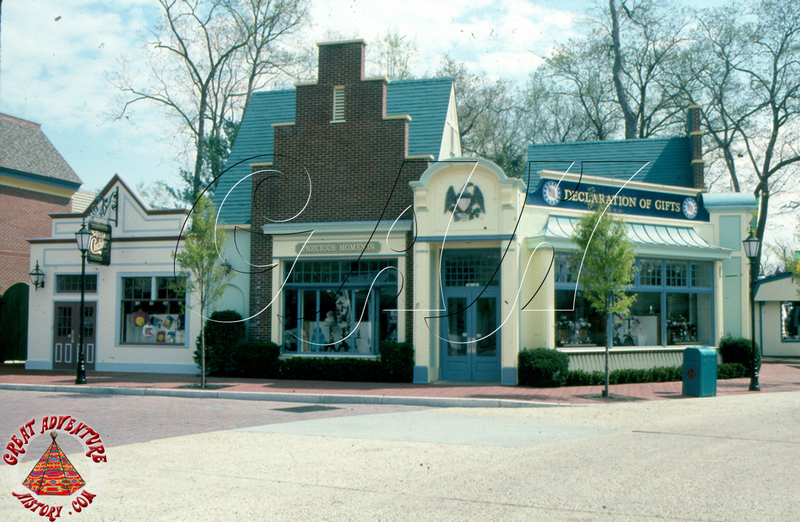 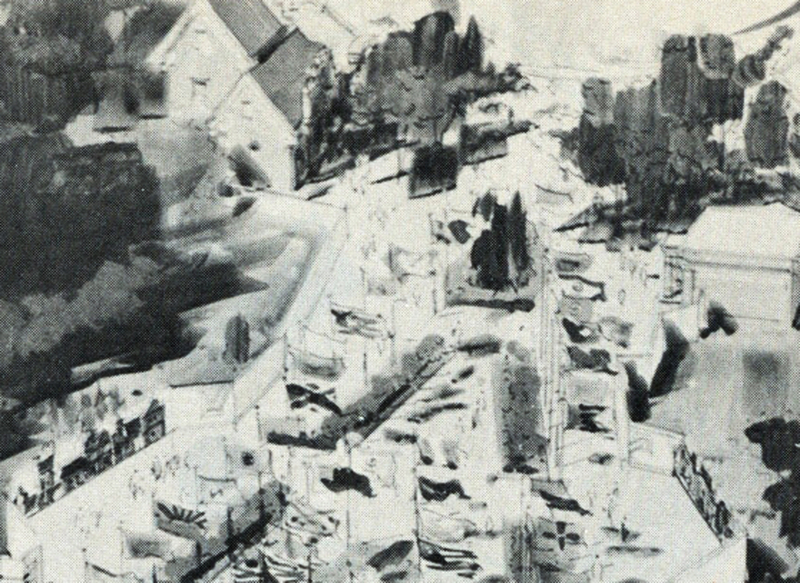 A new Looney Tunes Shoppe was built near the Declaration of Gifts and would be connected to it several years later creating one huge shopping area which would stretch from the Front Gate to the Fountain. 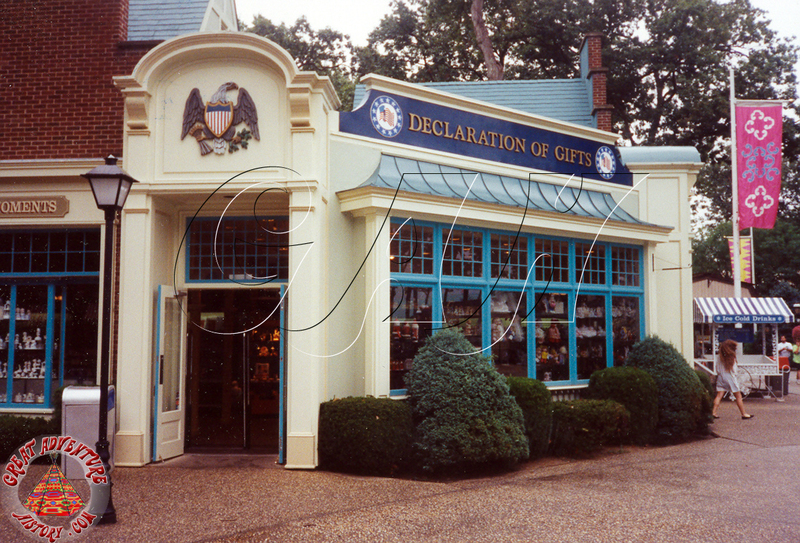 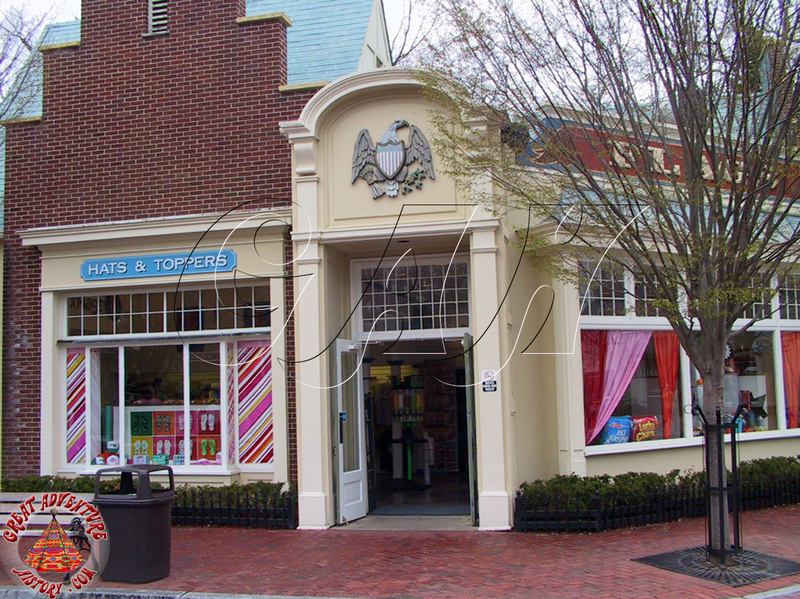 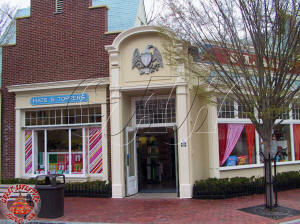 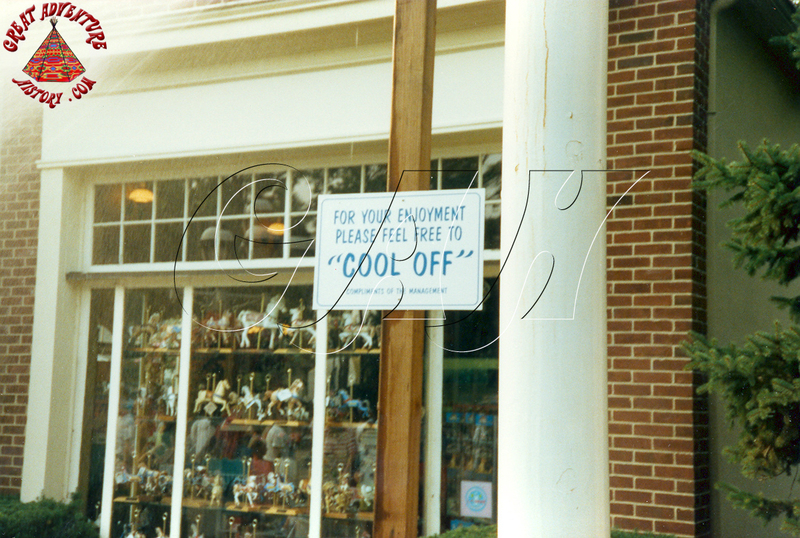 The shop was renamed Confetti in 1995 as part of the new lineup of merchandise on Main Street and the exterior of the building was given thematic enhancements to go with the improved entrance plaza area. 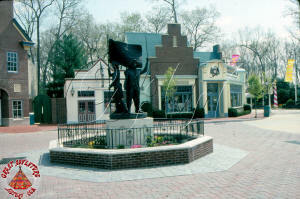 In 1999, the building was renamed again, becoming Town Square Toons and then again in 2000 as Flags. 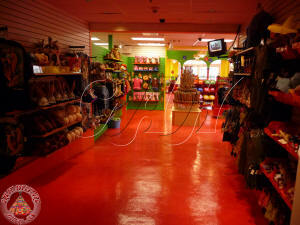 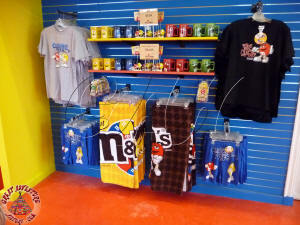 Through all these different variations the shop continued to offer Great Adventure merchandise and collectibles. 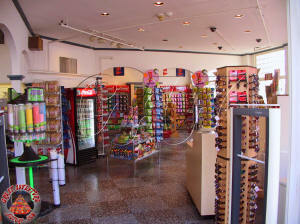 For the 2009 season the shop was given a major overhaul. 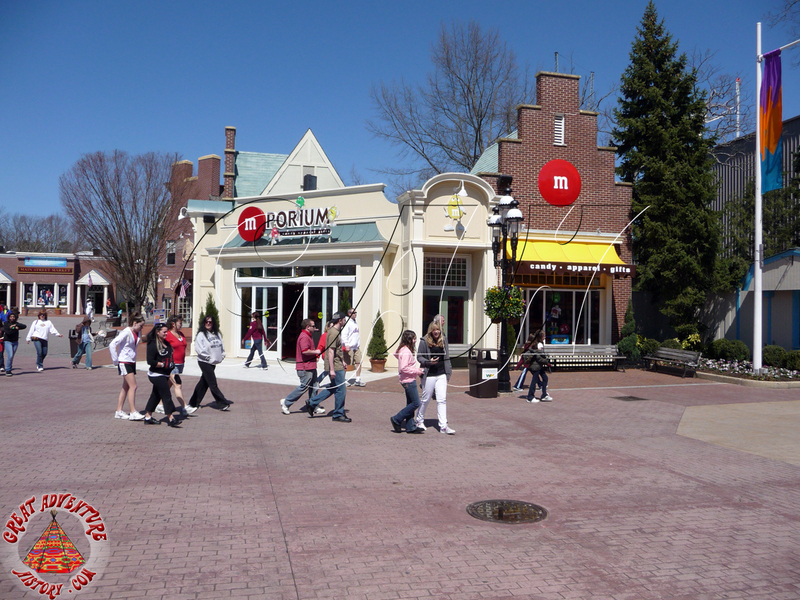 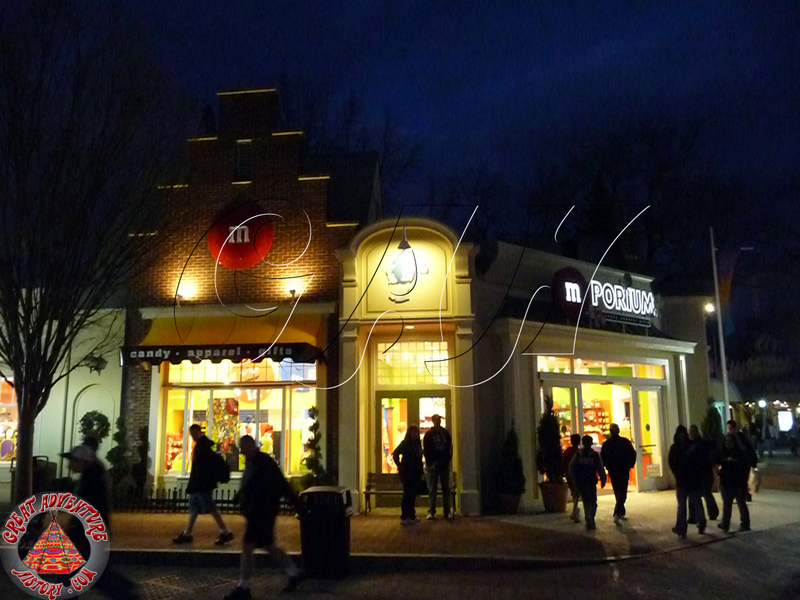 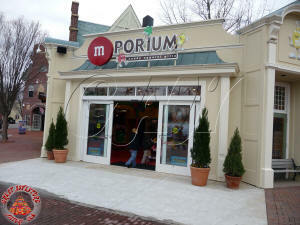 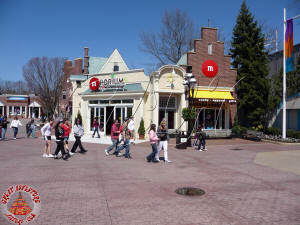 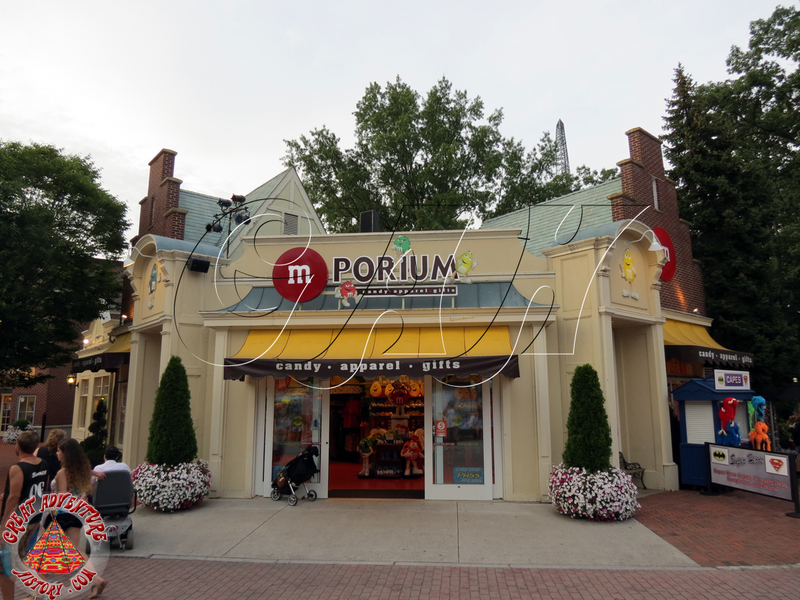 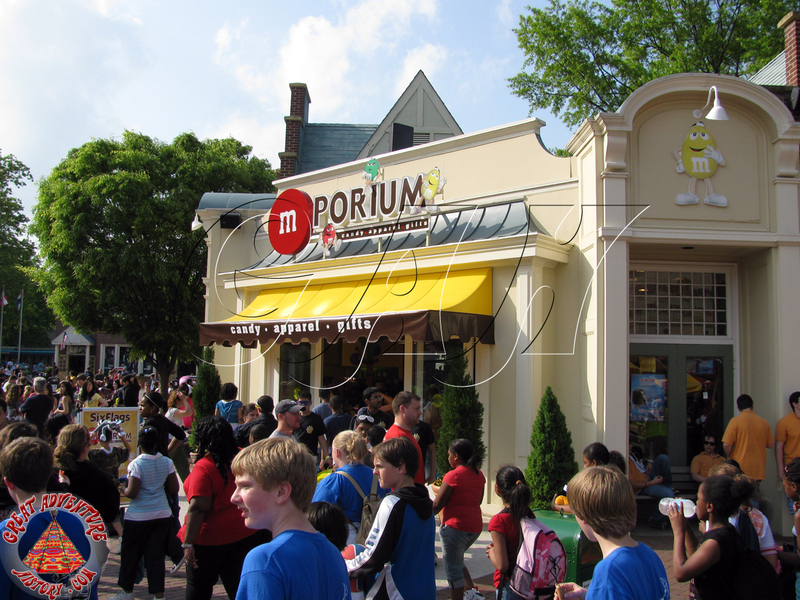 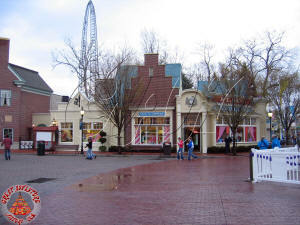 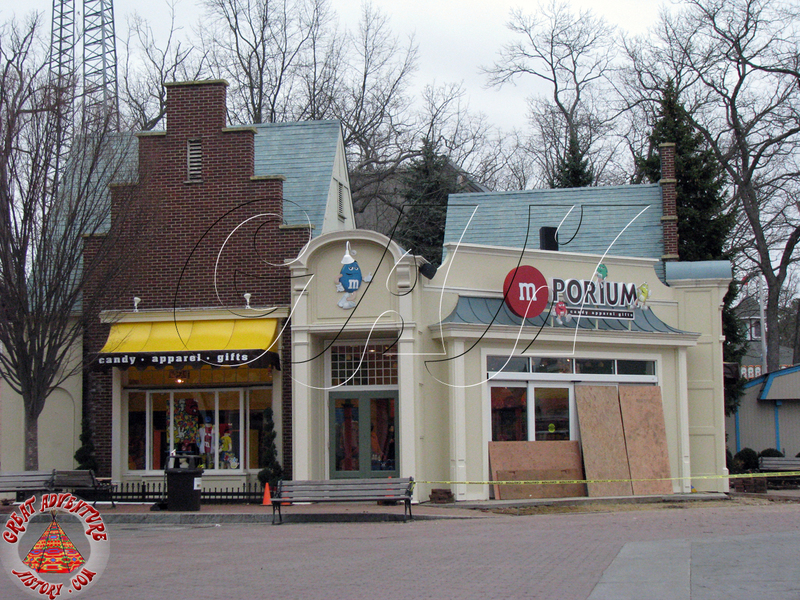 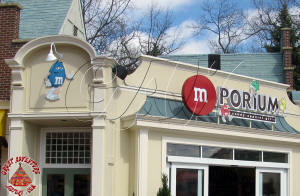 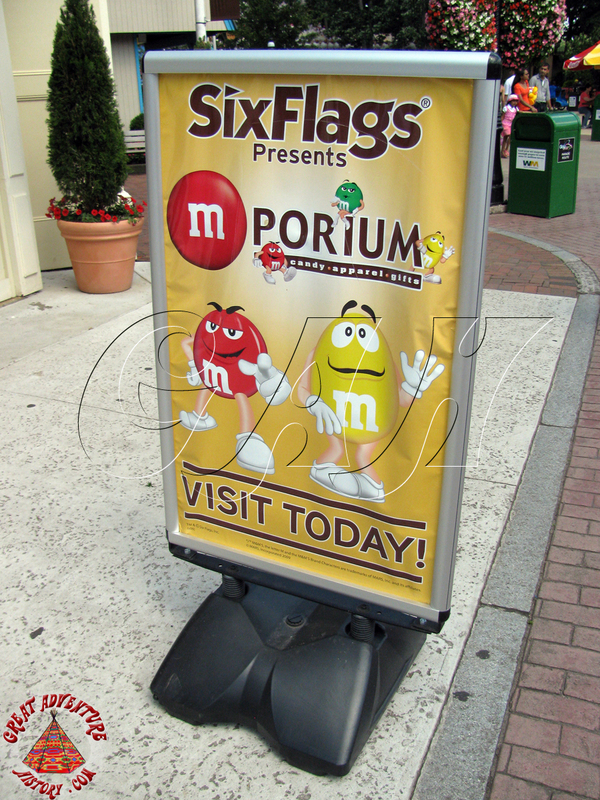 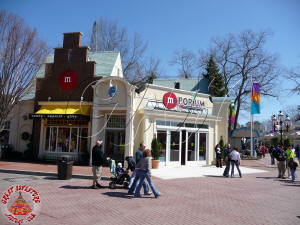 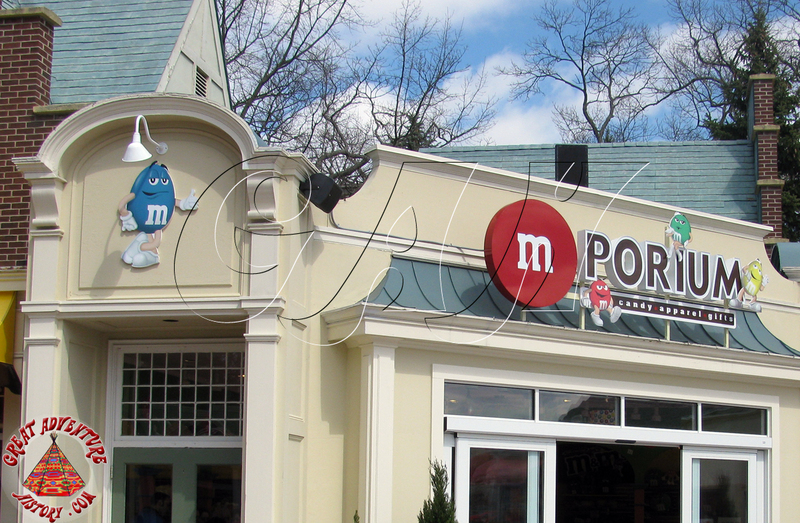 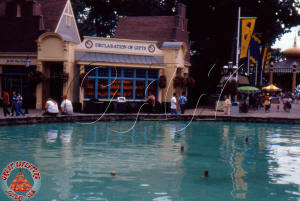 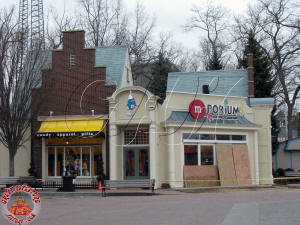 The M&M Mars company began to become a prominent sponsor of Six Flags and the relationship was taken to the next level with the introduction of the M-Porium. 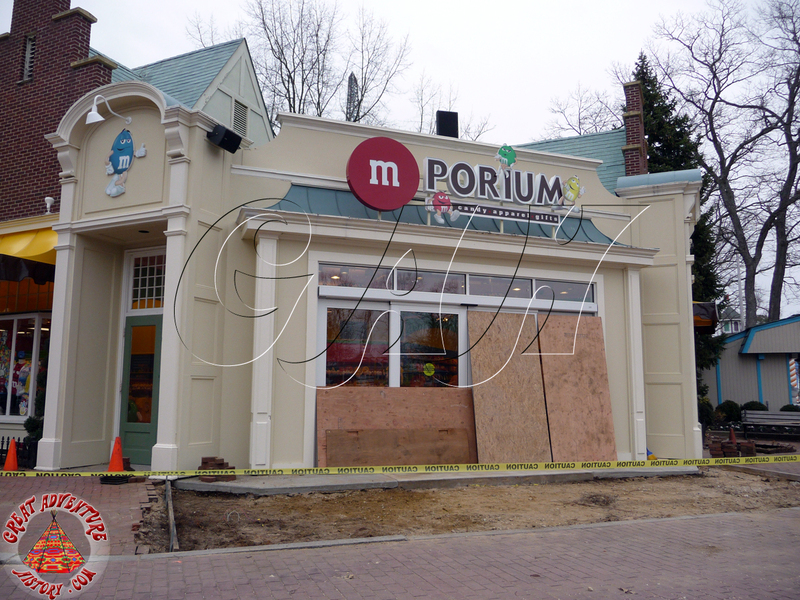 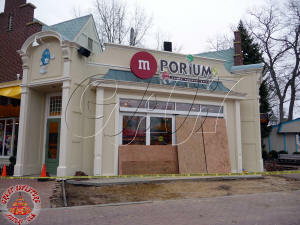 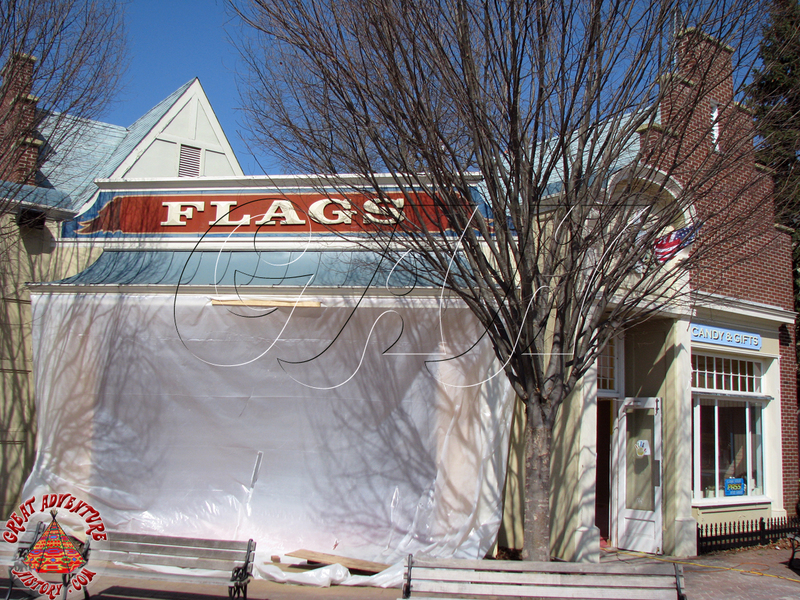 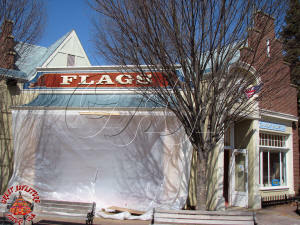 The biggest change was moving the shop's entrance to what had been the huge display window facing the Fountain. 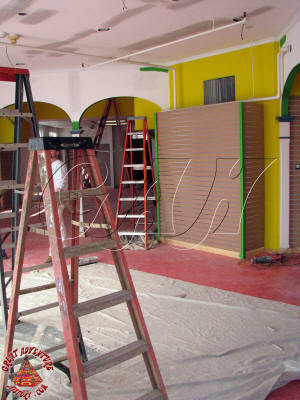 New automatic sliding glass doors were installed, creating a single entry. 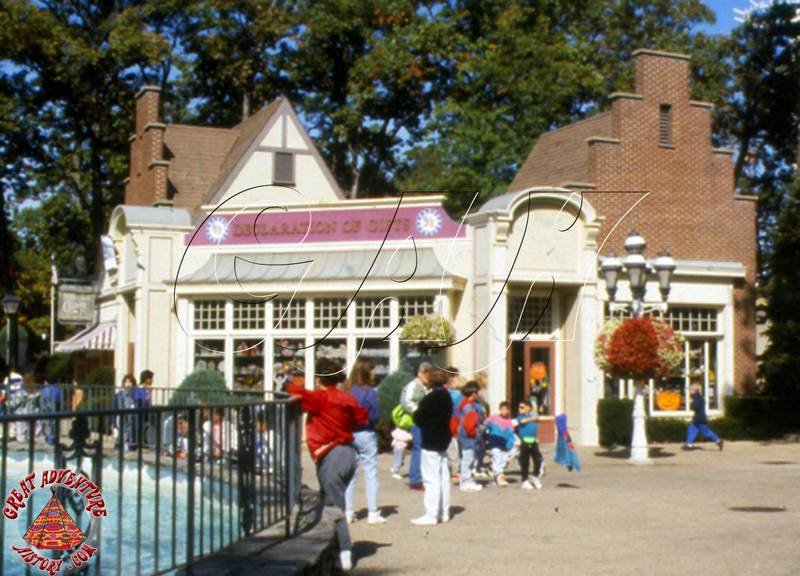 The two original sets of doors were closed off, with the windows being covered with M&M decals and blocked off with benches. 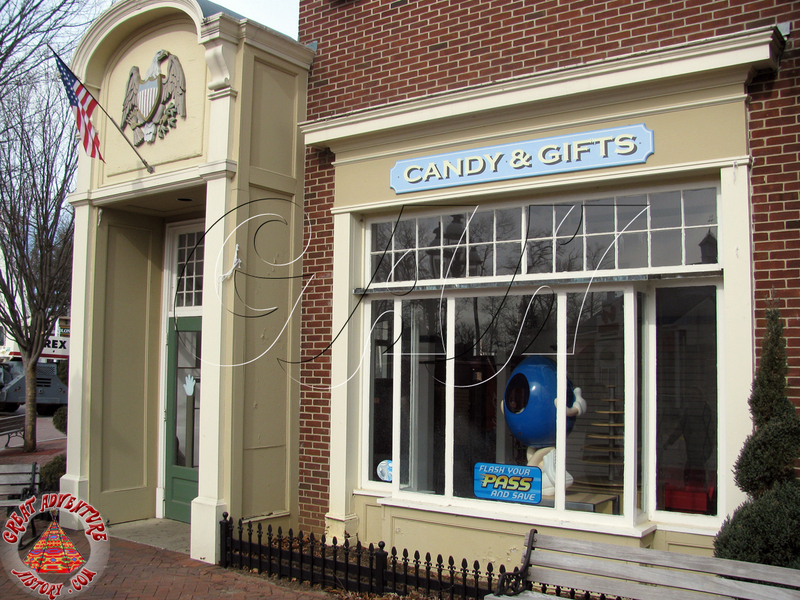 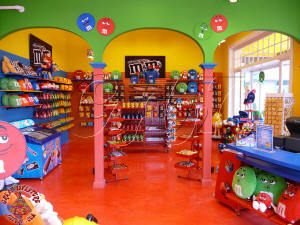 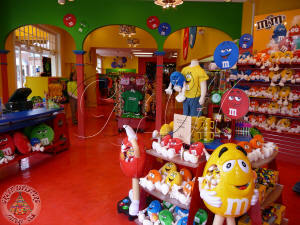 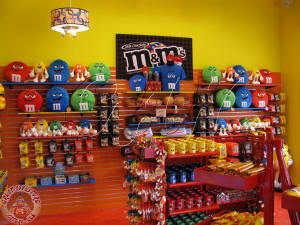 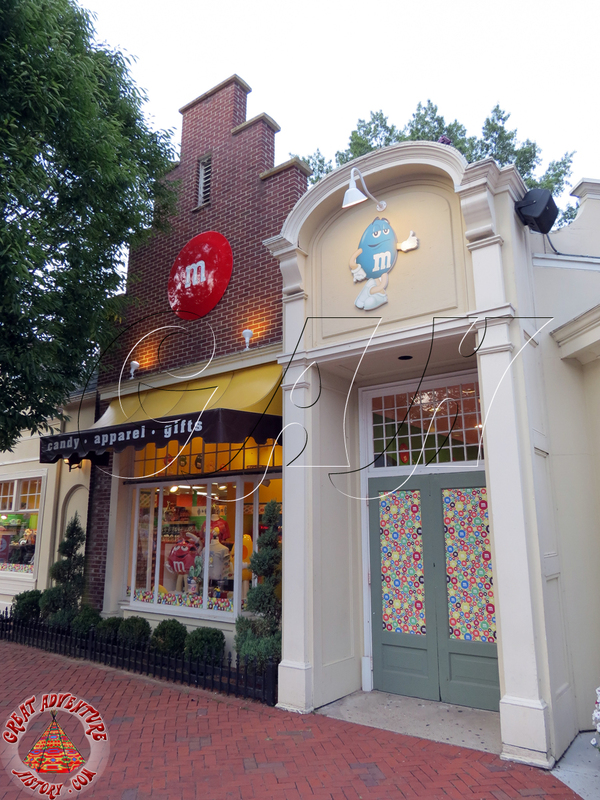 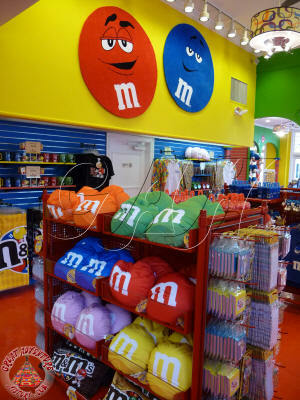 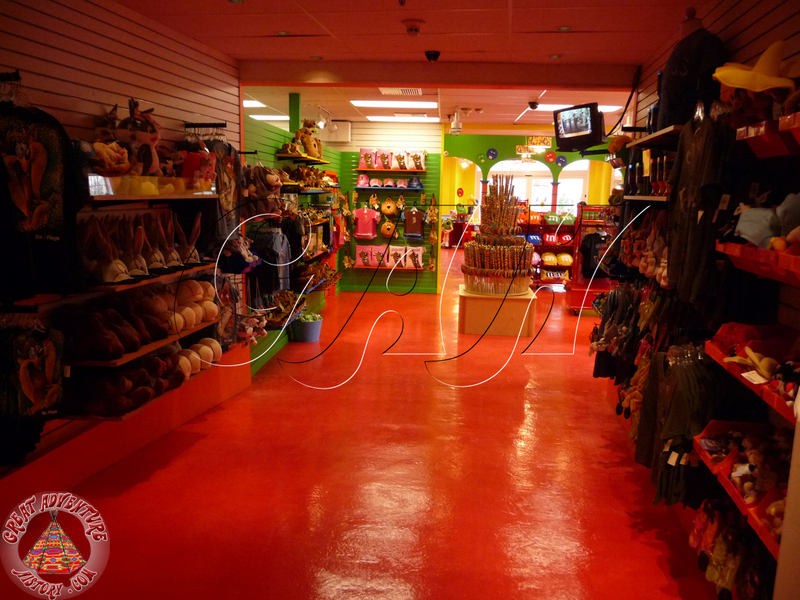 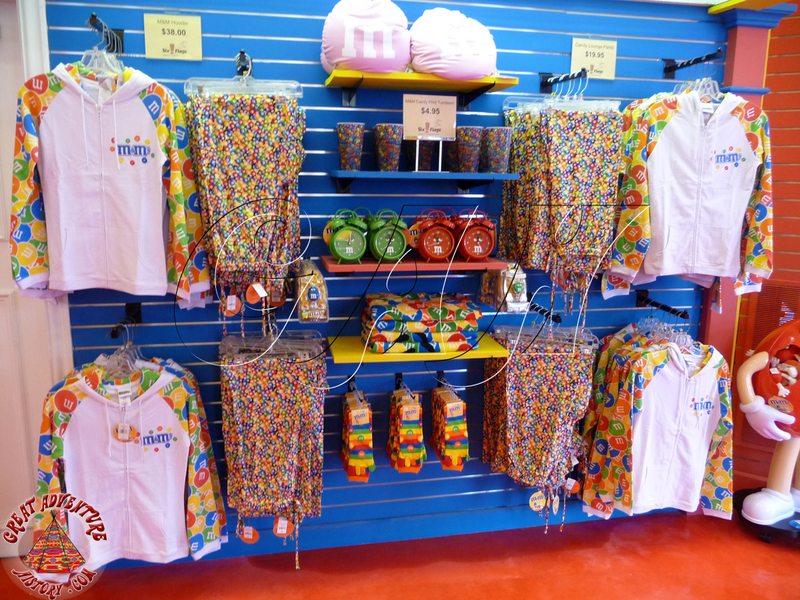 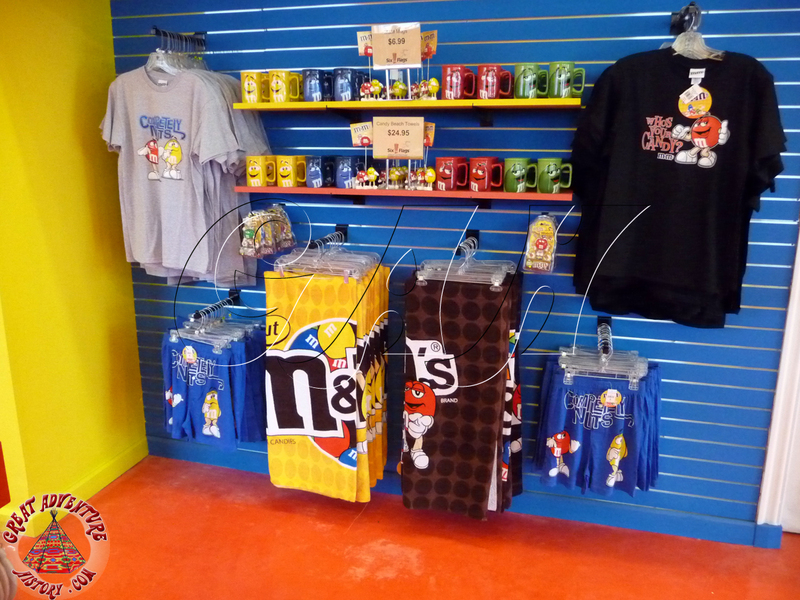 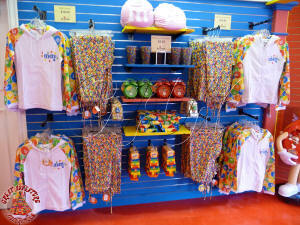 The new shop would feature everything M&M's from candy to toys to plush. 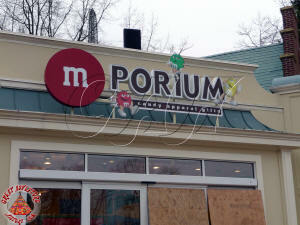 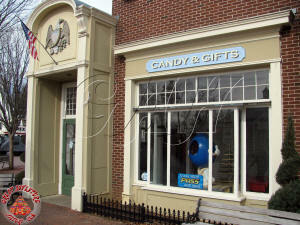 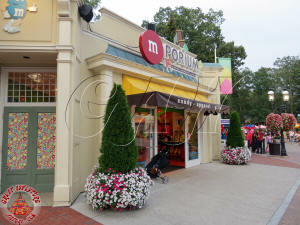 As part of this makeover the colonial theming was totally stripped and the interior was painted in bright candy colors. 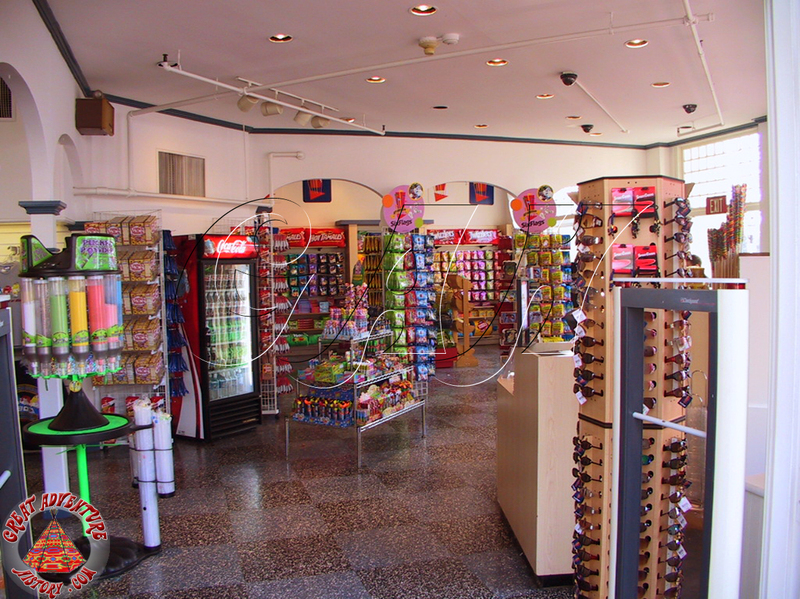 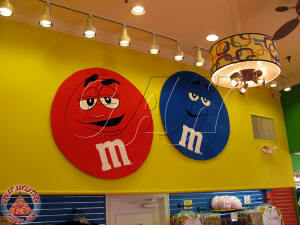 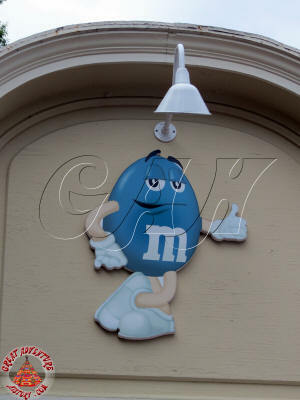 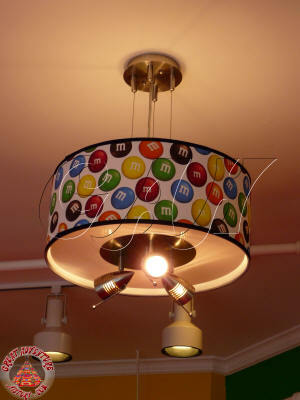 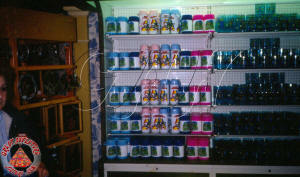 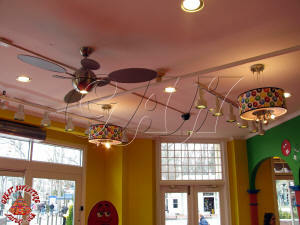 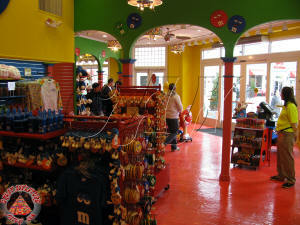 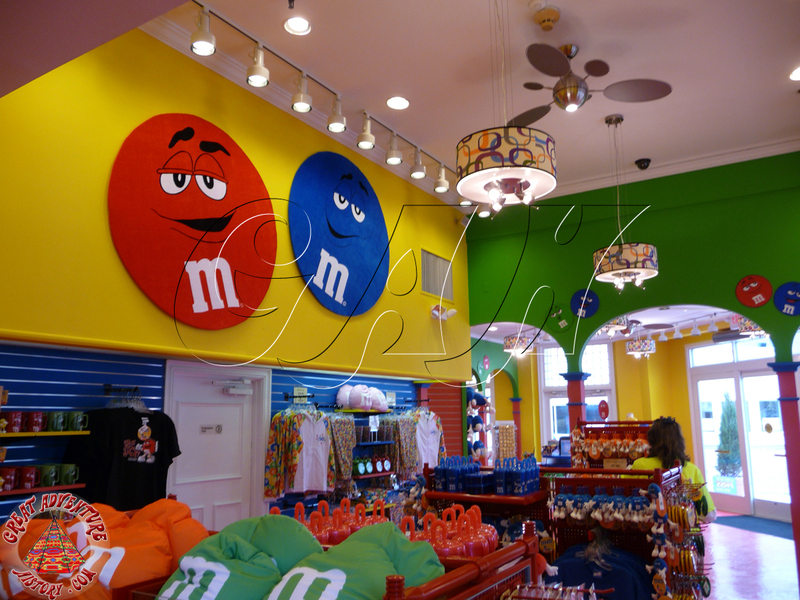 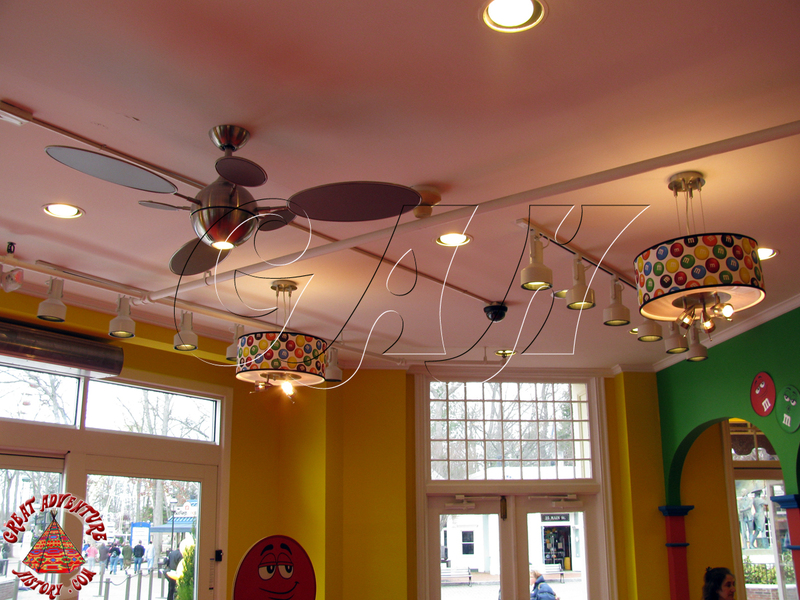 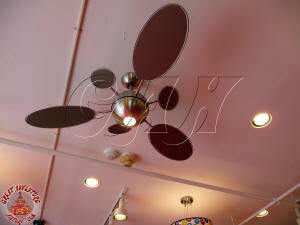 New modern fixtures were added and the shop became a real showcase for M&M products. 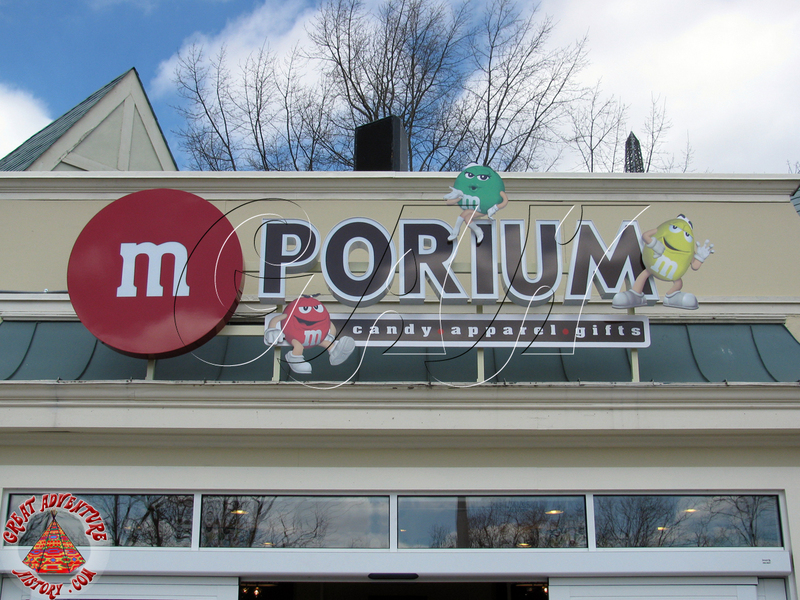 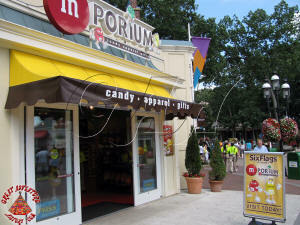 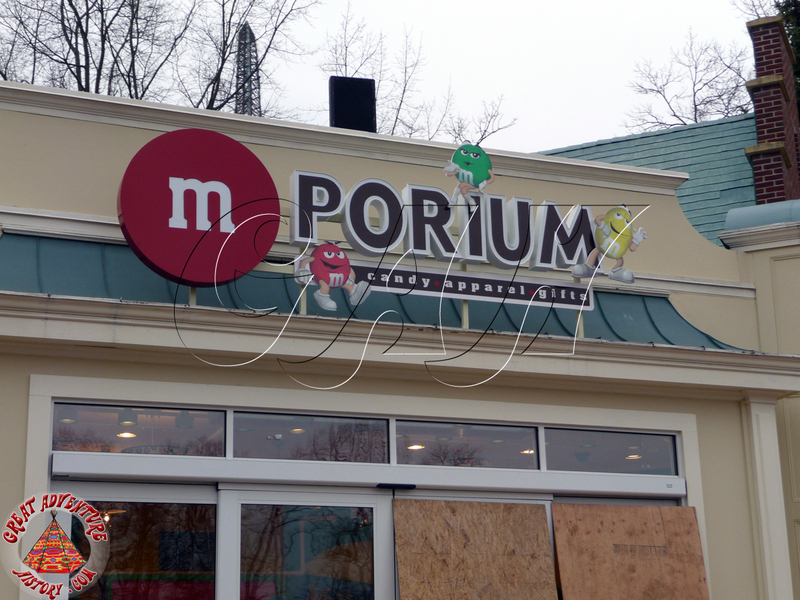 The colorful M-Porium has become a favorite shop for many park guests with the popular candies and characters taking center stage.